My name is Moe Shalabi, and I am the proud manager of Pita King. I must admit, it has been a long and arduous journey to get to this point. I have worked in the restaurant business in Ann Arbor since I was 14 years old. 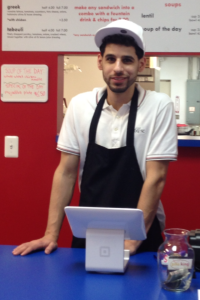 Since then, I have grown as an individual, a food preparer, a husband, and now a father of two sons and a restaurant! I look forward to continue serving Ann Arbor, but now, for the first time, I will be doing so from my very own Mediterranean and Middle Eastern inspired menu of fresh and healthy foods. My wife (Fefe) and I cannot wait for you to try and fall in love with the high quality sandwiches, soups, salads, entrees, and starters we have to offer.